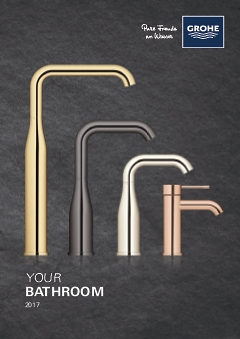 The GROHE Eurosmart aesthetic brings a contemporary, uncluttered style to your bathroom, and this wall-mounted trim in hard-wearing metal with concealed body continues that tradition. The lever arcs subtly to let you vary water temperature and flow effortlessly. The GROHE StarLight chrome finish has a clear, luminous lustre and needs only a wipe with a dry cloth to return it to its pristine state. This trim set can be fitted with a concealed body such as the GROHE concealed single-lever mixer (35501000) that incorporates the GROHE SilkMove cartridge and mounts on the wall with no need for screws thanks to the user-friendly GROHE QuickFix system.